Flying Fish Seafoods specialists buy from fisherman who use sustainable methods to catch their fish off the Cornish coast. Specialists in sourcing and supplying fresh fruit and veg. We work closely with them every month when creating our menu to find out what's coming in/out of season and which veggies have had a particularly good harvest. A family run traditional butcher. Their longstanding relationships with Wiltshire and Somerset farmers who practice excellent animal husbandry and welfare, using natural feed and not rushing animal growth, means they can deliver to us the very best cuts of meat. We use a company called Aqua Aid for the supply and maintenance of our tap water filtration and cooling machines. 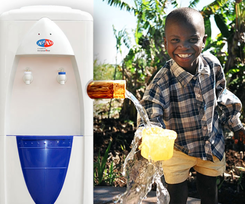 Aqua Aid work (together with Christian Aid) to bring water supplies to many of Africa's most impoverished regions. With the help of customers (such as ourselves at The Circus Restaurant), they have managed to donate in excess of £12 million to charitable projects. Keep drinking our complimentary, filtered tap water! Originally started as an addition to the Bertinet Cookery School in Bath, the bakery has now grown and grown. Richard Bertinet is now one of the most respected bakers in the country. His bakeries never use flour improvers, processing aids or enzymes-ingredients that are often used to increase shelf life. Instead they use natural wholesome ingredients and traditional techniques. We use their E1 Espresso Project beans which they buy directly from a farmer (Ricardo) in El Salvador. Being Rainforest Alliance certified as well as organic, Ricardo's farming practices are both experimental and ecologically sustainable in equal measure. The production of cider at Midford farm is still a family run business. The apples are picked from the orchards in and around the Midford area to produce a beautiful, full, rounded traditional cider.